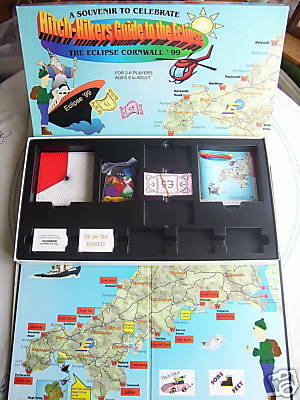 The object of the game is to be the first player to reach the ECLIPSE OPTIMUM VIEWING POINT to observe the eclipse in Cornwall, August 1999, between Hayle and Helson,having managed to accumalate a total of 50 for the entrance fee. This is achieved by carrying out casual work at WORK PLACEs available around the coastal regions. Once you have landed on a WORK PLACE you are in a position to take an interview for work with the outcome decided by the throw of a dice. If passed you can work to earn some money. CORNWALL and DEVON are divide by the TAMAR RIVER. The game starts by crossing the TAMAR to enter CORNWALL. You can then walk or HITCH HIKE your way around CORNWALL whilst trying to reach these WORK PLACEs. BE CAREFUL-YOU ONLY HAVE 3 DAYS (72 HOURS) IN WHITCH TO ACHIVE YOUR GOAL!!! !